Guo, Y., Wang, Z., Zeng, Z., Zhang, S. and Chen, R. (2017). Proboscis Extension Reflex in Apis mellifera [Honeybee] with Only One Antenna. Bio-protocol 7(23): e2624. DOI: 10.21769/BioProtoc.2624. The proboscis extension reflex (PER) is a common classical conditioned reflex which is widely used in the neurology and ethology. In honeybees, PER experiments can train bees to associate an odor with a reward or punishment. Here we present a variation of the PER experiment in Apis mellifera that trains honeybees using only one antenna. This variation on the PER paradigm could assist research efforts in fields which study lateralization within the nervous system. Vertebrate brains can solve complex tasks with regional specialization (Kandel et al., 2000) and this may also be the case in invertebrates (Frasnelli et al., 2010). To date, experimental evidence for lateralization, a form of regional specialization, in honeybees has been documented for simple olfactory classical conditioning. For example, asymmetry in use of the antennae (Letzkus et al., 2006; Rogers and Vallortigara, 2008) with associated asymmetry of anatomy (i.e., sensilla number and electroantennographic responses of antennal neurons (Anfora et al., 2010; Frasnelli et al., 2010)). The honeybee Apis mellifera displays a clear laterality in responding to learned odors (Guo et al., 2016). By training honeybees on two different versions of the well-known proboscis extension reflex (PER) paradigm (Kuwabara et al., 1957; Bitterman et al., 1983), we demonstrated that bees respond to odors better when they are trained through their right antenna. To our knowledge, that was the first report of asymmetrical learning performance in an insect. In summary, our modified protocol can be used to further explore lateralization in invertebrates. For this experiment, we use worker bees from a single drone inseminated (SDI) queen of Apis mellifera ligustica. We begin the PER experiment in the morning of the eighth day after worker bees emerge. We remove the bees from the rectangular boxes and randomly assign them into three groups: Left antenna covered (LAC), Right antenna covered (RAC), and Control. This results in two trained groups (LAC and RAC) and one untrained group (Control). We cool the bees on ice for about 5 min until they stop moving (Letzkus et al., 2006). We fix each bee in a metal tube with thin strips of tape so that only the two forelegs and head are free to move. For the two trained groups, one of their antennae is covered with a two-component silicone rubber compound to ensure that the bees are trained by a single antenna. When we cover the antennae, we place the head of the bee on a sponge. After we mix the two silicone rubber compounds, we dip a toothpick in the mixture, and then carefully cover the antennae of the bee with the mixture. 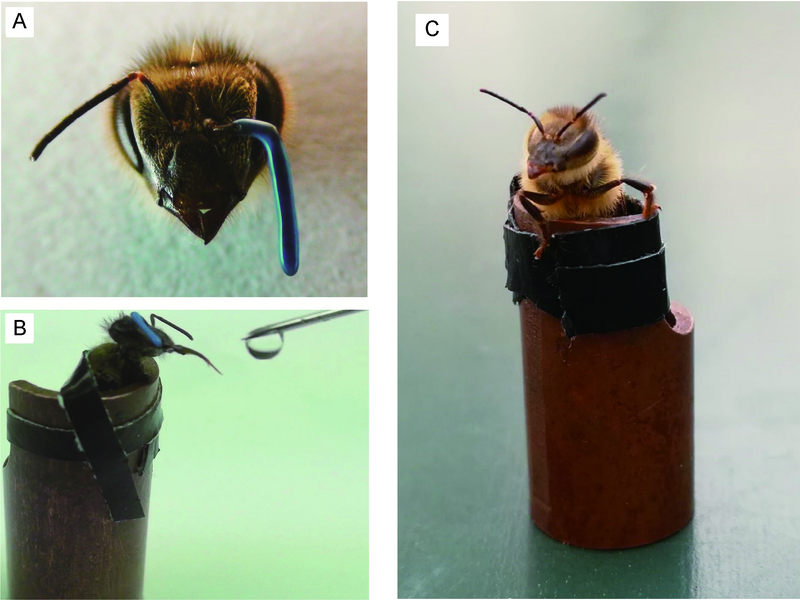 In contrast, the antennae of control group bees are left free (Figure 1A). Next, all of the bees are briefly fed with one or two drops of 1 M sucrose solution (see Recipes) and then moved back to an incubator to recover. Note: The bees are still fixed in the metal tubes while they are inside the incubator. Two hours later, we train the bees with a positive stimulus and a negative stimulus. The bees do not need to be anesthetized at this time because they are fixed in the tube. In this experiment, lemon odor + 1 M sucrose solution is used as the positive stimulus + reward，and vanilla odor + saturated saline solution (see Recipes) is used as the negative stimulus + punishment. We mix the odor with the reward or punishment. More specifically, we add 30 µl lemon odor to 4 ml 1 M sucrose solution and 30 μl vanilla essence to 4 ml saturated saline (27.74%, w/w). The bees are trained to discriminate between these two different odors. During training, the bees are first given a stimulus, then the appropriate reward or punishment. 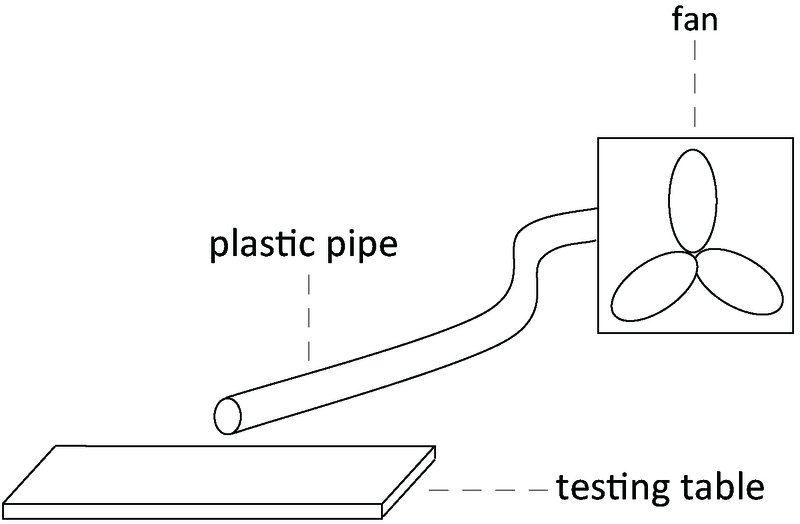 We place a small suction fan connected with a plastic pipe behind the bees to maintain a constant flow of odor during the stimulus (Figure 2). The fan also allows us to quickly remove any residual trace of odor before beginning the training of the next bee. (Figure 1B). Figure 1. PER experiment. A. Antenna covered with silicone rubber compound; B. Feeding the bees with sucrose water; C. Control group bees with two antennae uncovered. Each bee is given three trials with an interval of 6 min. Each trial contains a positive and a negative stimulus training (Masutaro, 1957). On the first trial, the bee is given a positive conditioned stimulus. A droplet is placed about 1-2 cm from the bee’s antennae using a 2.5 ml syringe with needle. The bee is removed after it has extended its proboscis and tasted the solution. If the bee does not extend its proboscis in 5 sec, we briefly touch the antennae with the stimulus drop to prompt it to give a response to the odor. Then, the bee is given the negative stimulus with the same procedure above. If a bee never extended its proboscis or was inactive, it was discarded after the first trial. After training, the bees are fed 2-3 drops of 1 M sucrose solution and returned to the incubator for overnight storage. In the morning on the next day, retention tests are performed. For the LAC and RAC group, the silicone rubber is not removed until the retention tests are finished. For the retention tests, the bees are first given the negative stimulus, and then the positive stimulus. As in the training, the stimulus droplet is placed 1-2 cm from the bee’s antennae and we wait 5 sec. If the bee extends its proboscis (within 5 sec) when it is given the positive stimulus, but not when given the negative stimulus, it is recorded as correct. If not it is recorded as wrong. Each bee is tested in three trials with an interval of 6 min. To pass the test: bees must respond correctly to the positive stimulus in at least two of the three trials and must not respond to the negative stimulus in all the three trials. After the tests are complete, the heads of the trained bees (bees that passed the test) and those of the untrained bees (control group) are cut with scissors and stored in 1.5 ml RNase-free tubes in liquid nitrogen. See Figure 3 for the whole procedure. The data of our experiment has been published in Scientific Reports (Guo et al., 2016). The training results are shown in Table 1. When bees are given saturated saline solution as negative stimulus, it is important to only let them eat a little saturated saline solution. We have noticed that bees that consume a lot of the saturated saline solution tend to die after training. We acknowledge Prof. Yong Cao for providing the silicon compound for covering the antenna. This work was supported by Chinese Academy of Science Strategic Project of Leading Science and Technology (XDA01020402), the National High Technology Research and Development Program (“863” Program) of China (2012AA020402 and 2012AA02A202), the Earmarked Fund for China Agriculture Research System (No. CARS-45-KXJ12), the National Natural Science Foundation of China (No. 31260524) and the Research Fund for the Doctoral Program of Higher Education of China (No. 20123603120005). The authors declare that there are no conflicts of interest or competing interest. Anfora, G., Frasnelli, E., Maccagnani, B., Rogers, L. J. and Vallortigara, G. (2010). Behavioural and electrophysiological lateralization in a social (Apis mellifera) and in a non-social (Osmia cornuta) species of bee. Behav Brain Res 206: 236-239. Bitterman, M. E., Menzel, R., Fietz, A. and Schafer, S. (1983). Classical conditioning of proboscis extension in honeybees (Apis mellifera). J Comp Psychol 97(2): 107-19. Frasnelli, E., Anfora, G., Trona, F., Tessarolo, F. and Vallortigara, G. (2010). Morpho-functional asymmetry of the olfactory receptors of the honeybee (Apis mellifera). Behav Brain Res 209: 221-225. Guo, Y., Wang, Z., Li, Y., Wei, G., Yuan, J., Sun, Y., Wang, H., Qin, Q., Zeng, Z., Zhang, S. and Chen, R. (2016). Lateralization of gene expression in the honeybee brain during olfactory learning. Sci Rep 6: 34727. Letzkus, P., Ribi, W. A., Wood, J. T., Zhu, H., Zhang, S. W. and Srinivasan, M. V. (2006). Lateralization of olfaction in the honeybee Apis mellifera. Curr Biol 16(14): 1471-1476. Masutaro, K. (1957). Bildung eines bedingten Reflexes von PAVLOVs Typus bei der Honigbiene, Apis mellifica. J Fac Sci Hokkaido Univ Ser VI Zool 13(1-4): 458-464. Kandel, E. R., Schwartz, J. H. and Jessell, T. M. (2000). Principles of Neural Science. McGraw Hill. Kuwabara, M. (1957). Bildung des bedingten Reflexes von Pavlovs Typus bei der Honigbiene, Apis mellifica. J Fac Sci 13: 458-464. Rogers, L. J. and Vallortigara, G. (2008). From antenna to antenna: lateral shift of olfactory memory in honeybees. PLoS One 3(6): e2340. How to cite: Guo, Y., Wang, Z., Zeng, Z., Zhang, S. and Chen, R. (2017). Proboscis Extension Reflex in Apis mellifera [Honeybee] with Only One Antenna. Bio-protocol 7(23): e2624. DOI: 10.21769/BioProtoc.2624.